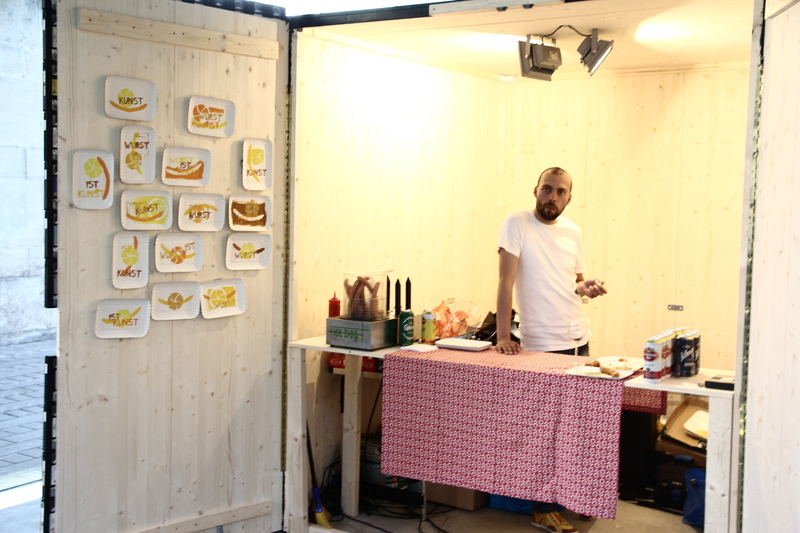 Hannes Egger shows “Kunst ist Wurst” (Art is Sausage) at the EXPORT Cubus in Vienna. The artistic field research throws the affirmation “Art is sausage” into the room and gathers reactions to the statement. A mobile sausage stand with the inscription “Kunst ist Wurst” serves as a platform for communication, in which the artist hands out sausages with mustard and bread. He serves it with canned beer. The sausage stand is the traditional German-Austrian variant of a snack stand. Sausage stalls were originally founded to secure an income for war invalids. The Wurstbude is generally regarded as the place where all social classes meet. It is a deeply democratic place, where, in addition to eating, multiple communications take place. “Art is sausage” questions the relevance of art. The existential meaning of art in the sense of “food” is examined, and the project also deals with the social and democratic structures of art production.